The atmosphere around the NOS Events Center was filled with love and good energy as hundreds gathered to hear the heart-pounding beats during Insomniac's annual Crush SoCal. This year's line-up included Slander, Unlike Pluto, Peking Duk, Goldfish, Bonnie X Clyde and Afrojack. The San Bernardino show coincided with other Crush events in San Francisco and Dallas that same weekend. The lone art installation at Crush SoCal, the focal point of the night. While there was minimal decoration on the outside of the venue (a heart-shaped art installation was the only focal point outside of the building), there was no doubt festival goers came for the music. The stage was erected inside the Damus Building (on the outside, the building was adorned by light-projected hearts) and as expected, the background was a heart-shaped LED screen surrounded by lasers. The Damus building draped in hearts. The night started off with a techno-driven performance from Sweet & Low. The Israeli-born duo amped up early arrivals and definitely set the tone for the rest of the night. Bonnie X Clyde continued the night with a powerful set and it flowed perfectly into Goldfish's house driven production. Things began to get grimey and hard with the sounds of Peking Duk, who included many urban songs and a surprise to me, the Macarena. The two best performances of the night have to go to both Unlike Pluto and Slander, who delivered a 1-2 punch to my ears. Slander had the entire audience on their feet towards the end of their set with their hit, “Love Again”. A laser light show during Unlike Pluto's performance. Grammy-award winning producer Afrojack closed out the night. His set included many of his hits, and to my dismay, he did not really live up to my expectations that night. The entire hour-long performance seemed pre-produced and many people started to leave early on. While the man is a great talent, my night ended on a sour note. This being a Valentines themed event, many of the night's DJs had special love songs included in their sets. While it was great to see couples enjoying the moment, it was a weird feeling being single during those times. Nevertheless, headliners continued to party on and enjoy the night. 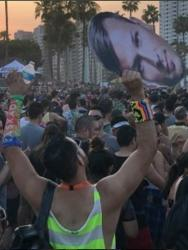 One of the few totems in the audience that night. With that being said, Insomniac had another successful event to add to their repertoire and they did not have to give much effort into immersing their headliners as they do in other events such as Escape or EDC. Crush SoCal is a single-day event that is really only meant to be enjoyed through the ears and not the eyes. No banners welcome you to the event, no special performers roam the grounds, no art installations or immersive environments, just you and the love for the music.